Carissa Kautz makes the layup. 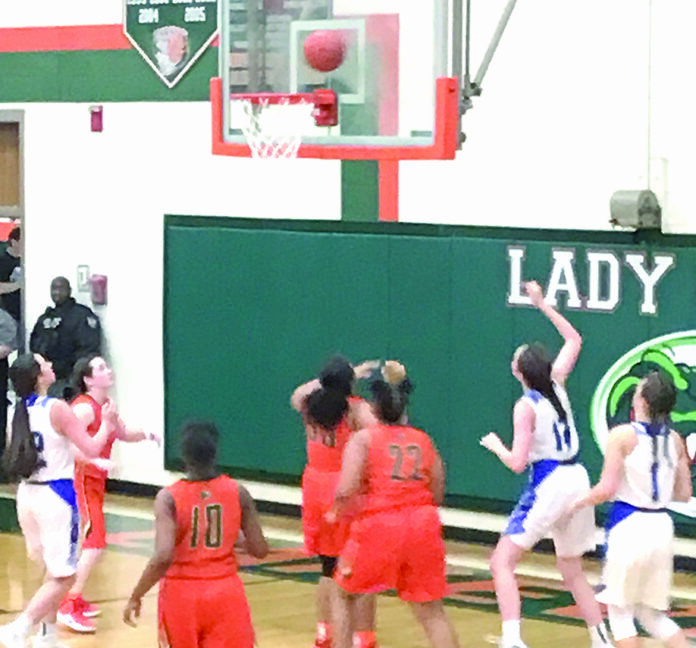 Saint Mary’s lady Tigers took to the road last week to face the Lakeview Gators. The Lady Tigers jumped all over the lady Gators early and often. They led 18 – 2 with just a minute to go in the first quarter of play. The Gators added a point from the free throw line before the quarter would expire. SMH was up big after one, 18 – 3. The Lady Gators were throwing up wild shots that rarely found rim or net. Coach Collin’s squad forced half court pressure on the Gators and it proved to be to much for them to handle. Tigers went on a seven:two run as half of the second quarter ticks by, 23 – 5. Lakeview elects to go to full court pressure against Saint Mary’s at this point. It is of little good and SMH is up to the task of breaking the press. McKinzie Lipa sank one of two from the line as Gator pressure equals fouls. The lady Tigers are in the bonus for the remainder of the half and lead 26 – 8. Lipa hits what looks like a baseline three, but it is ruled a two. Maggie Gilmore takes a vicious charge in the lane giving the Tigers the ball with under a minute before half time. Emily Maggio goes to the charity stripe with 1.3 seconds to go and hits one of two from the line. A lane violation on the second shot gave Maggio another chance but she can’t convert making it a 30 – 8 lead. Saint Mary’s starts the third period the way they finished the first half, with intense ball pressure on defense resulting in steals and turnovers. Maria Bienvenu gets in on the action with a steal and layup extending the lead 36 – 8. SMH sets the half court offense when they get into the front court. They work on quality shots to lead 41 – 8 after three. The Tigers have possession to start the fourth quarter. Senior Hailey Seamen gets a steal and traveled the distance to score on a right-handed layup. The ticking clock seemed to go a little faster and the lady Tigers take a 50 – 16 victory back home across the river.